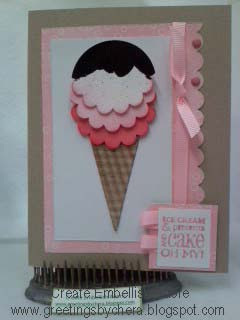 Create Embellish Adore: You scream we all scream... for ICE CREAM! You scream we all scream... for ICE CREAM! OK, well the ones in my house aren't! Who cares if its March... you cannot go wrong with a bowl (or cone) of some good ole ice cream! I 'waffled' the cone with using the crimper! It was so easy! AND FUN! Then I sponged the Kraft CS with some Close to Cocoa for the darker ridges. I popped up the ice cream scoops with dimensionals & no ice cream is complete without a little chocolate Syrup (which is embossed. I used some retired DSP for the pink tones, added some brads, ribbons and little square from Birthday bliss! WAH LA- 10 minutes card! Now that we are all running to the freezer for a scoop or two of ice cream, I have to tell ya.. I had this for my birthday dessert ... no ice cream for me! .. cannot believe it. The kids were soooooo disappointed.. but they will get over it.. they can use the calories more than me! 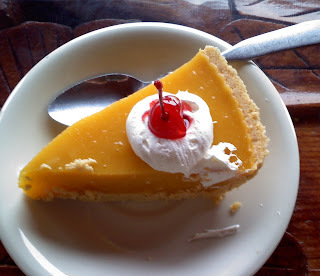 He was heavenly - all the chunks of mango that were nessled on the graham cracker pie crust... ooooooooooo its was soooo good! Just look at that gorgeous color! And... since it was my birthday IT WAS FREE!!!!! ... of course this was lunch... and my boss took me out for my birthday lunch.. so nonetheless... yumm yumm for me!!! Mmmmm! Delicious! Love this card. If you enjoy challenges Chera, drop by www.justscraps.ca and visit with us. Would love to have you play along!